Having been the subject of modernisation by the current vendors and now offering spacious and modern accommodation throughout is this extended, 3 bedroom semi detached family home, that should be viewed internally to be fully appreciated. This gas centrally heated, under floor heated (on ground floor only) and uPVC double glazed property comprises on the ground floor of a entrance hall, living room, high quality, modern fitted kitchen/breakfast room, separate dining room, useful utility room and a modern fitted cloakroom. On the first floor are 3 bedrooms (2 doubles and 1 single) and a modern fitted, fully tiled bathroom. 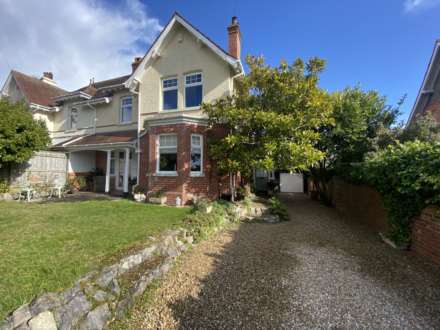 Further benefits to the property include a block paved driveway that provides off road parking, single garage and an enclosed and easy to maintain garden to the rear. Attractive fully tiled walls and flooring. Low level WC. Wash hand basin. Extractor fan. Inset ceiling lights. Window to rear and double opening French doors to side leading out to the rear garden. Attractive fully tiled walls with under floor heating. Radiator. Coved ceiling. Up and over door to front. Personla door to rear. uPVC double glazed window to rear. Gas and electric meter boxes. There is a level, enclosed and easy to maintain rear garden that has been laid to an attractive slate paved patio. This area provides an ideal area for outdoor dining and sitting during finer weather. Timber fenced boundaries. Slate stone chippings. Outside water tap. From our prominent Town Centre office, proceed out of town on Salterton Road. After passing Tesco on the left hand side, and at the next set of traffic lights, turn left into Dinan Way. Take the 3rd turning left into St Johns Road where the property will be found on the left hand side, clearly identified by our For Sale sign.